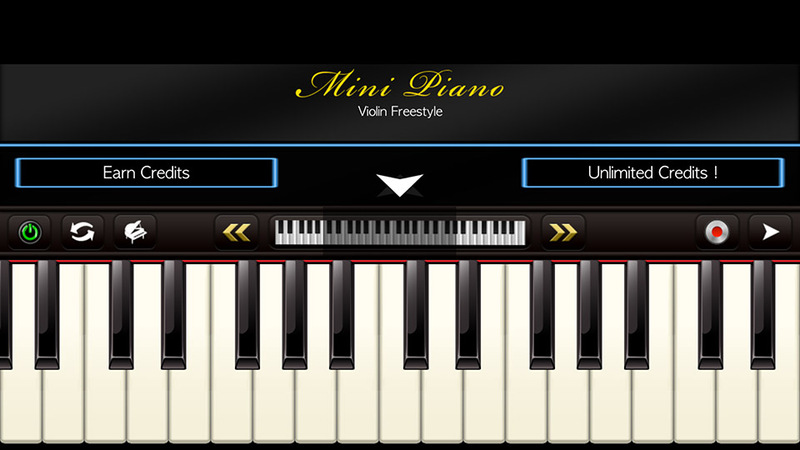 Mini Piano ® is a fun on the go App which you can use right off the bat with its intuitive interface, and it's great for kids and adults. It is available on Apple AppStore, Google Play, and Windows Marketplace, all for free. There are In-App Purchase (IAA) and In-App Advertisements (IAP). 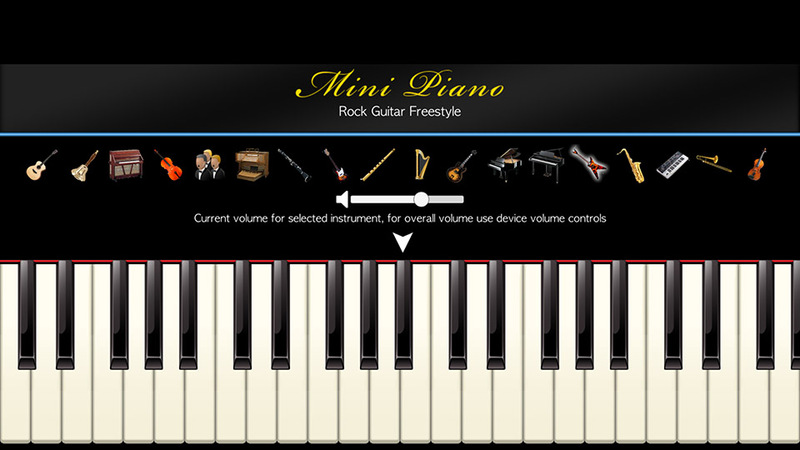 Its features include a set of full scalable 88 piano keys, choosing from different instruments to play, custom engineered 44100khz sampled audio, recording and saving your own tunes, choosing from many popular songs, new songs added weekly, three songs modes - Watch and Listen, Easy Play and Learn; a built-in selection of beats, and Global Leaderboards. There is a total of 18 different instruments for you to choose from, comprising popular instruments like guitar, violin, cello, piano, organ, flute, and harp. Tapping on the main keyboard area plays the selected instrument at the correct pitch, using custom engineered 44100 khz sampled audios. That is freestyle playing. With a full set of 88 piano keys, it is not possible to present all at the same time without playing inaccurately. Thus, it has a scalable feature that allows you to zoom in and out of the keyboard. The recording mode allows you to save that sudden inspiration on the road, which otherwise could be forgotten by the time you have access to a physical keyboard. After you stop the recording, choose a slot to save it in. You can save up to a maximum number of 10 recordings. Give your recording a meaningful name, up to a maximum of 16 characters, including space and other symbols. 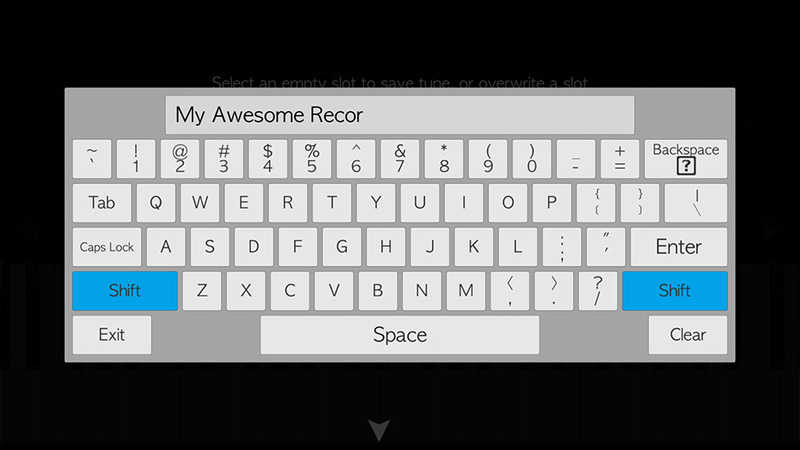 In the screenshot above, "My Awesome Recor" is as far as we can go. Hitting the "Enter" key on the virtual keyboard will lead to a message that informs you of the successful save operation. Finally, playback anytime by selecting any saved recording from the slots. This feature is definitely great for composers! 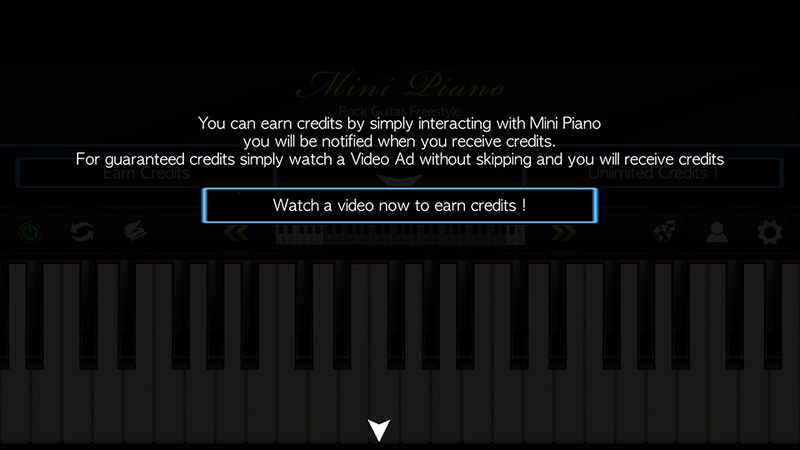 However, Mini Piano ® delivers more disappointment than entertainment. At the most top of the screen, there is a layer of black bar that sits throughout the whole app. You can be looking through the list of songs, configuring your profile, or choosing another instrument instead of piano; and that black strip remains there - a waste of screen estate. Any experienced app developer will understand how important it is to maximise the potential of the already small mobile device's screen size. 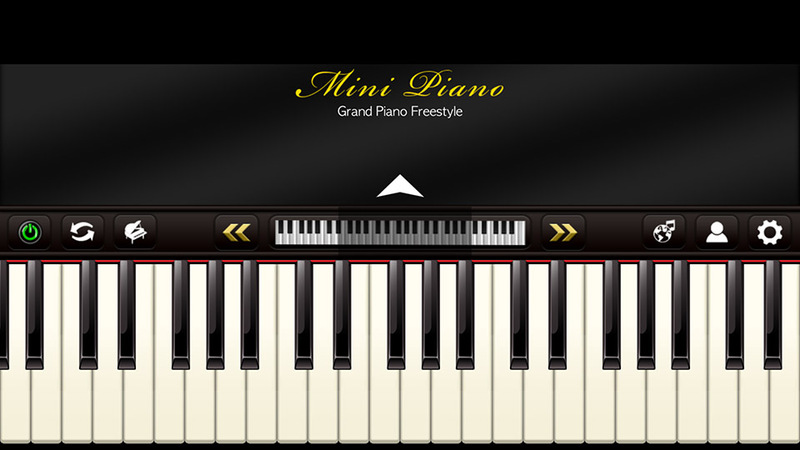 The yellow "Mini Piano" logo is also taking up precious space to redundantly remind you that you are using the Mini Piano app. 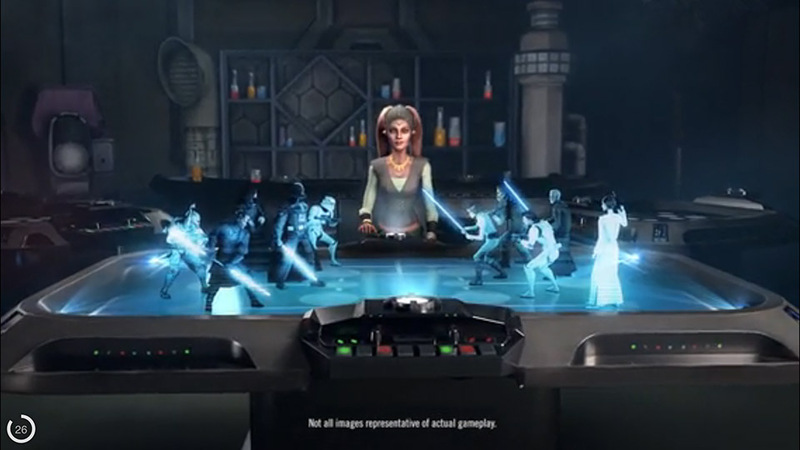 In the second screenshot above, the dual keyboards, which consists of the full 88 piano keys, could potentially be shown larger if the (i) top black strip, (ii) logo, and (iii) blank space above the big white arrow; are removed. The priority should be given to the main play area. A few icons are also misleading. The 2nd icon from the left looks more like a "refresh" rather than its intended mode switching. The yellow double left and right arrows which are meant to zoom out and in of the keyboard in between them, suggest more likely some sort of a left and right movement. Replacing them with magnifying glasses or +/- icons might be more appropriate. The "Shift" key in the virtual keyboard is not working at all. In order for you to input a capital letter, you have to use the "Caps" instead. If you prefer to follow a song and play, you will have to first choose one from the list. But there is a credits system in place that is frustrating. Don't get me wrong, there is nothing wrong with a developer who wants to monetise his app by implementing a credits system. This is in fact a common strategy. However, the trick is to keep the user's experience within a satisfactory level. Most of the songs cost 5 credits each, and only a selected few are free. When you select a "free" song, there is a surprise waiting for you. You get a 30-second advertisement video that starts to play without a chance for you to exit. Thus, there is nothing you can do but to sit through the 30 seconds. Notice the countdown timer at the bottom left in the second screenshot above. Extra surprise! You might think that the advertisement is a one-time inconvenience. But the truth is: choosing the exact same "free" song after a while smacks you with a déjà vu. A 30-second advertisement video plays, again. 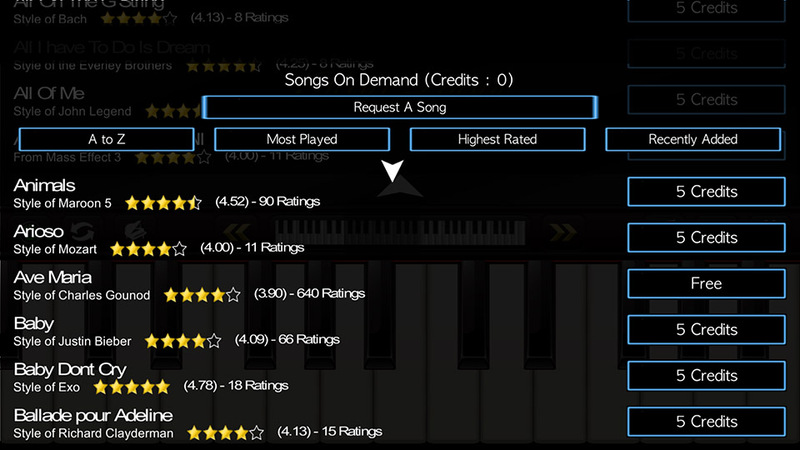 If you select a song that costs 5 credits, you should proceed to the next step to start playing, no? Well, whether it is a bug or a feature that we cannot confirm, the app can still play the advertisement video. Yes, 30 seconds again. But here's the consolation: 5 credits are added to your balance instead. From a user's perspective, tapping on the "5 credits" should honour what it's supposed to do consistently: deduct 5 credits and let him enjoy his spend, without any more inconvenient ads. 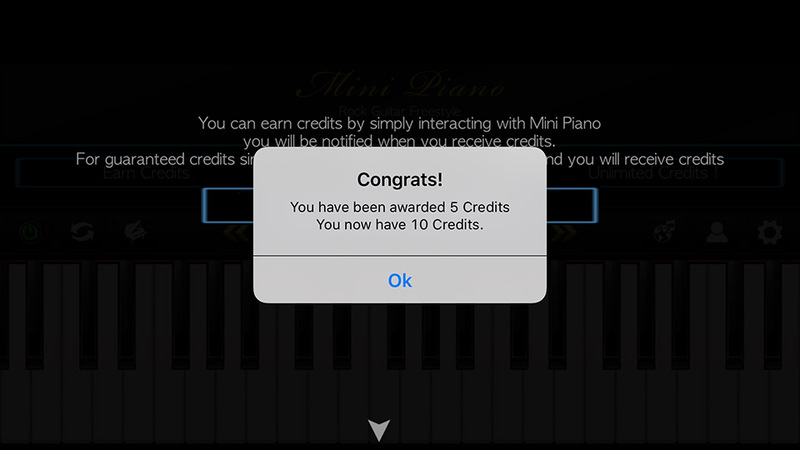 If you navigate away while in the midst of playing the 5-credits song, and choose the exact same song afterwards; you have to expend 5 credits again. There are 2 ways you can obtain more credits. First, you can earn 5 credits by watching a 30-second advertisement video. But be warned, you could be trapped in the situation shown in the 3rd screenshot above. There is no way to return back to the main screen. The possibly only solution is to force shutdown the app, and you lose the credits earned in that session you watched the video(s). 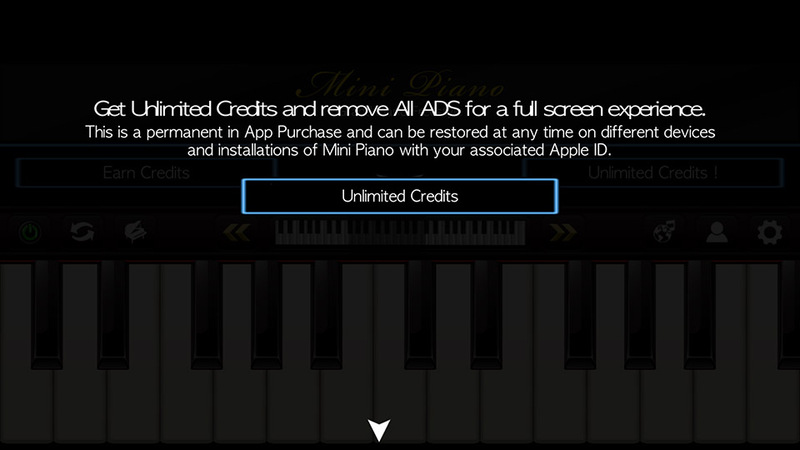 Second, remove all Ads and have unlimited play by purchasing "Unlimited Credits". However, the risk that you have to undertake is the unknown price to pay. 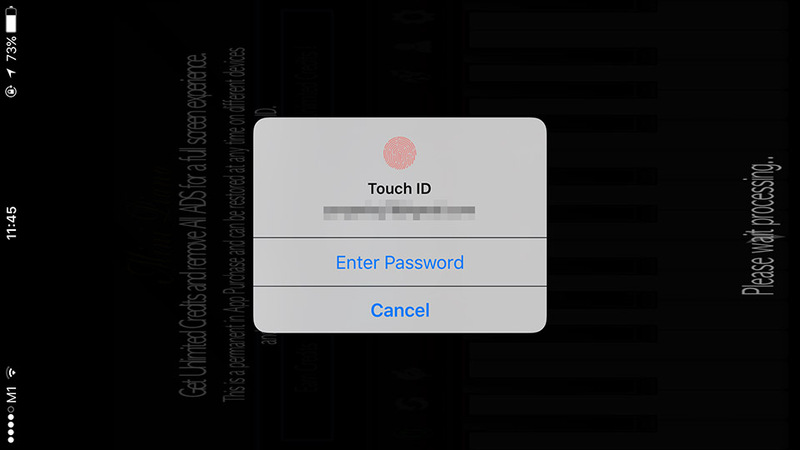 The app immediately prompts for the Touch ID or Password, which iOS users know it's the last step before your credit card gets charged. There is also no obvious page in the app that discloses the price. 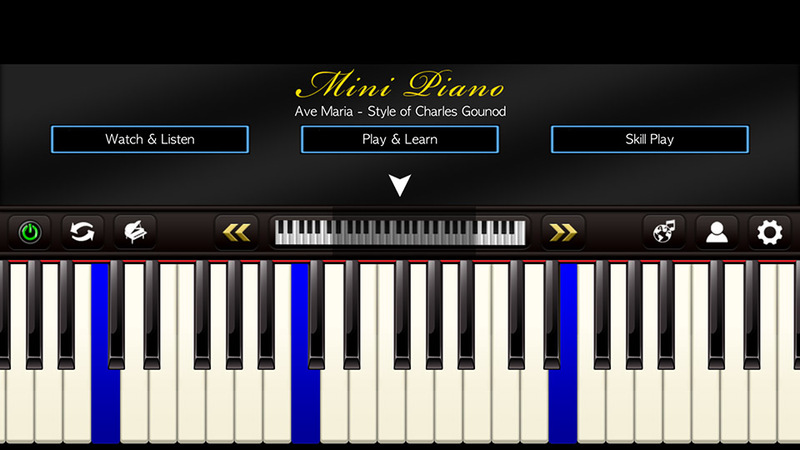 After selecting a song, you can choose to "Play and Learn". 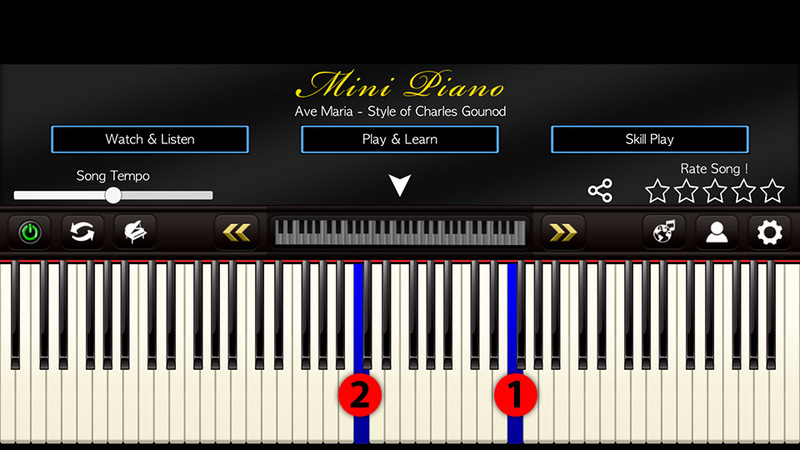 The app shows you the next key to play by highlighting it in blue. 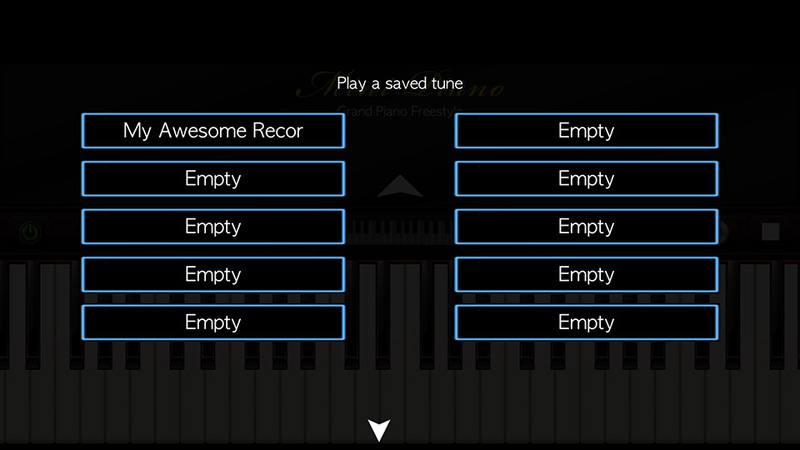 Thus, you just have to tap the blue keys in succession to hear yourself playing the song. There is, however, one quirk. For example, in the screenshot above, Key #1 is shown first, then Key #2. When you tap on #1, you don't hear the sound produced by that very key. Instead, you hear the sound of #2. 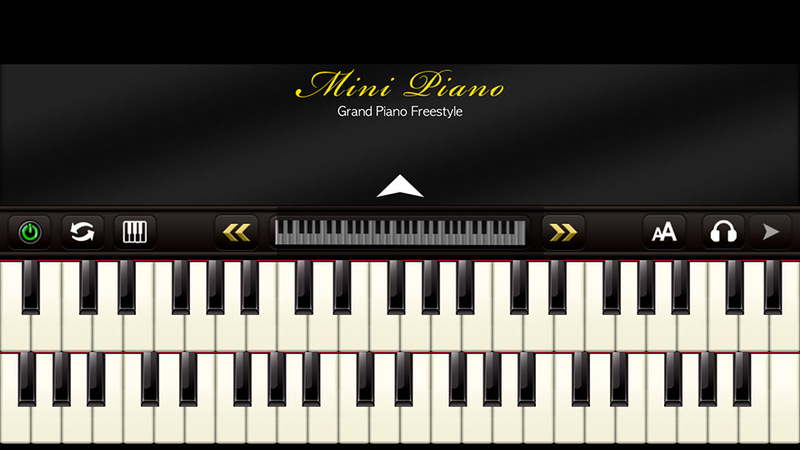 This might be unintuitive for those who have some background in playing a keyboard. You will hear a low-pitch sound when you are actually playing a high pitch sound. In the "Watch and Learn" mode, the app plays the song on its own without needing any input from you. The keys are highlighted in blue accordingly. The rhythm might be slightly off if you listen close enough. 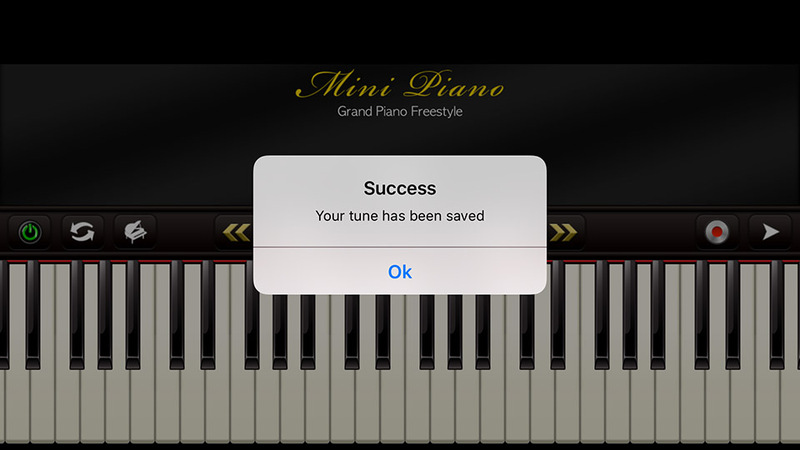 The Mini Piano ® app, v6.10, was run on an iPhone 6S Plus, iOS 9.2. The price of the app is a link that will take you to download the app.